Sunday a week ago, I commenced knitting on a lace sweater from Vogue Knitting Spring/Summer '99. The yarn chosen, Katia Capri, was a perfect substitution. On Monday as I made my way through the first repeat things looked a little off. I plowed on. When I compared the second set of full leaves to the first the error became obvious. The first set of leaves had a strange little crook in the bottom portion and originated from two branches like legs instead of single leg as in the second set of leaves. I went back to the mag and checked the photo which didn't have the noted imperfections. Rechecked the pattern. Yep, worked as written. It was time to get out the big guns. 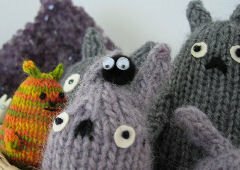 I gathered up several "treasuries" and located the closest relative of the offending pattern in A Treasury of Knitting Patterns. The Trellis Framed Leaf. I was amused by this statement included in Barbara Walker's description. It is often presented in an unnecessarily complex form. The magazine version repeats over 32 rows and has an additional openwork row separating the leaves. The treasury version repeats over 20 rows without any extra embellishment. I'll make an effort to sort this out later this week but for now it's mindless, quick gratification. You do need to take a break from the lace for a bit. Yikes! How maddening! I wonder if there is errata going back to that issue?